Yield, such an amazing word. We don't often think about this word unless we are driving and even then there is some apprehension in the action of yielding. I suppose this could be because there is an element of uncertainty, of vulnerability. 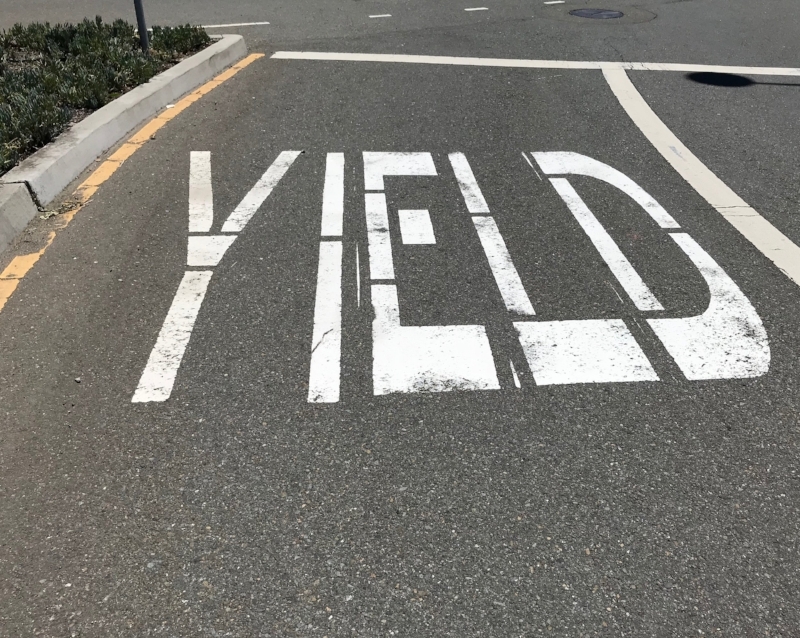 And yet Yield can be such an interesting word - soft, generous, intentional, purposeful - while ultimately taking you where you want to go, though perhaps a little slower. So yield in our driving, in our striving? Not only can we yield in our actions but also in our bodies. Softening the tensions in my shoulder blades, quads, between my eyes. So many places that tend to grip in Anticipation, as if putting the brakes on. Yield is a generous gesture that is inviting flow, not braking, and when approached from a mindset of cooperation can be a graceful movement forward. Augusta Moore, my Feldenkrais teacher, asks us to consider yielding in our cells. On a cellular level to soften, to be receptive and curious, to stop our habitual responses for just a minute and see how our bodies might respond in a different way than what might be predicted. To encourage this deeper yield it is helpful to be in a safe environment, reflective, mindful state. Vidyamala Burch, the founder of Breathworks, has a meditative practice of leaning into your difficult situation as if leaning the weightiness of the situation onto a bale of hay, noticing how the bale yields a little under your weight, softens the hardness of resistance. I find this helpful in letting my imagination understand what it means to yield on a cellular level - because really who knows how to do that?? It's something worthwhile learning and experimenting with. Just for a moment consider "What part of your body wants to yield?" Is there something in your mental, physical, or emotional being that would benefit from slowing down, stepping back, taking a deep breath, and yielding to the sweetness of the moment? What is calling you to pause and soften? Could it be a warm ray of sunlight on your face, a tight sore back that lets out a little complaint each time you move, or a sense of overwhelm that feels just so darn uncomfortable. The signs are all around us and we get to choose our approach - screeching brakes, distracted confusion, OR gently, with full intention, leaning into the situation and yielding into the flow. Often we find ourselves stressed out in overwhelm and the yield signs seem to be screaming at us to pay attention. But wait I don't have time to soften, what about my responsibilities? My To Do list? The many expectations I carry on my shoulders? So it seems easier to ignore those yield signs, go into overdrive and before you know it - Crash !! Lots of drama and disappointment to go around. Stopped action and possibly some collateral damage. The roller coaster of surge and crash with little yielding might be an exciting life for some or satisfying for a short period of time and then sooner or later the accumulative effect on the body says no more. Think about your car, or your spine, or your gut - just how many crashes can they go through before they no longer function in the ways you need them to? The mind too grows weary of constantly pushing upstream with little respite, sheer will power only goes so far and how pleasant is that? So where in your life is there the opportunity to experience the Yield? It could be in yoga class, during a work discussion, figuring out with your partner how to manage a difficult situation, or even right now - check in, is there anywhere you are holding tension or notice tightness in your body? Let your breath find and soften this place, imagining your muscles and skin giving in a little to the weight of gravity. I think that sometimes we worry "If I slow down I might just stop, or worse I might fail." And I would like to suggest that if you give it a try you might just find yourself right in the middle of that easy flow of life you've been dreaming about. Older PostWhat Works for You?